So inevitably, when I hear about awards, I jump to the scene in A Christmas Story, where the father wins “A Prestigious Award.” Fra-geel-lay, must be Italian. 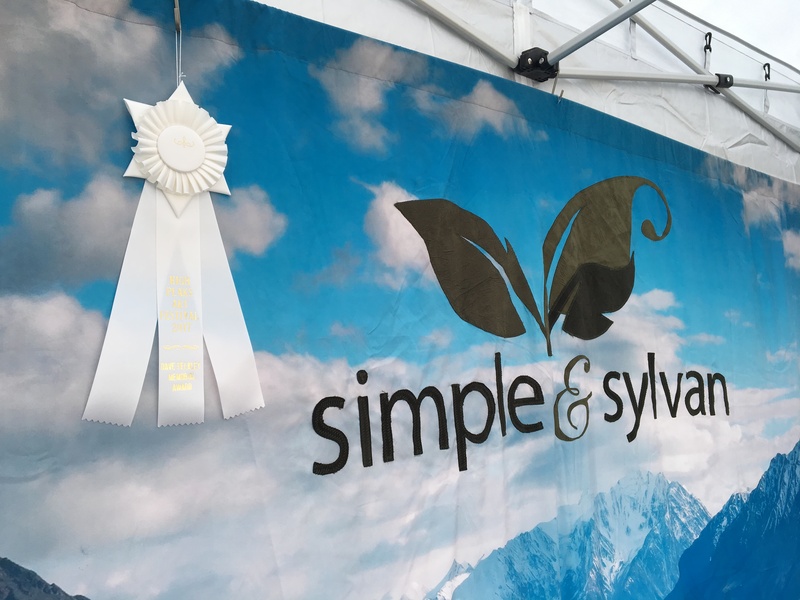 Last week was the High Peaks Art Festival which was my first real juried art show, with awards. I wasn’t expecting anything, but was a little hopeful. Friday I set up my brand spanking new, official art show booth tent. No more Walmart special that is falling apart, needs new screws, buttons are stuck and the feet are falling apart, but it still does the job. But these real art shows want something more substantial. Understandably. Google “art fair tent weather” for some destruction picts. The new one is not the top of the line, but it’s darn good. The top of the line is like $1200. All in due time. I have an Undercover R2. Rocky, another vendor at the show was kind enough to help me set it up. Nice to have some #protips. 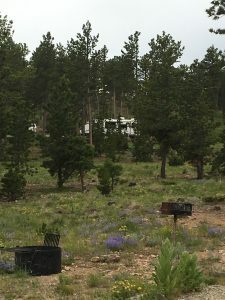 I camped just south of Nederland in the Roosevelt National Forest, at the Kelly-Dahl Campground. I pulled in Thursday afternoon, after coming from Loveland and our old friend St. Vrain. It was a lovely setting, with wild flowers in bloom, and nestled in the pines. Also quite the temperature difference, with it in the 90’s on the plains – I was in flannel jammies in those hills. 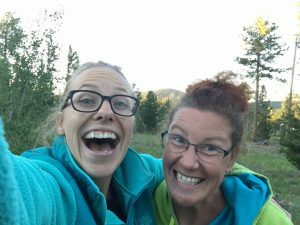 I did have a few heart palpitations about parking – there was this one tree that was too close for my comfort, but the Camp Host and a neighbor reassured me that I would be fine pulling out (I got in there just fine, didn’t I?). 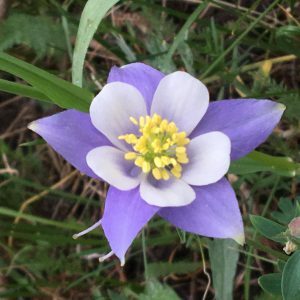 Kioko and I found a lovely patch of columbines on one walk, and then on the way back from another walk I saw some very fresh bear claw marks on a tree. So glad I saw that towards the end of the hike, and we hustled along with me loudly singing a favorite, but annoying Girl Scout song. Liv and Jess in the forest! Friday I also had a surprise visitor, Liv! Such great chats by the fireside. It was a great way to kick off the weekend! Saturday morning I was all set up and ready to go by 10am. It was a quiet start, but a couple came to my booth, twice. Thanks to RMMFI, the class I took last summer, it helped with crafting my story (along with so many other pieces to the business ownership puzzle). Between the couple’s two visits, we swapped stories, and talked about my motivation for my work. 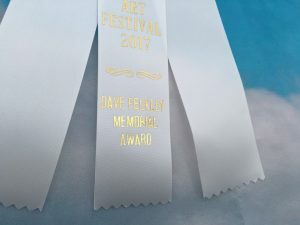 The third time they returned was with the show organizer and Mayor to award me the Dave Felkley Memorial Award. The couple was Dave’s family: his son Doug and wife Jean. What was so special was that they were able to share Dave’s story. 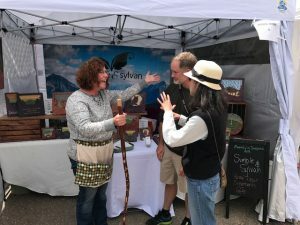 A long-time resident of Nederland who was known in the community for his love of the outdoors, working as a snowshoe guide, and was woodworker as well. My story of my recent change, and the house on wheels resonated with the family, and I am so honored. This award is so much more meaningful than a “best of” category, it resonates with mindfulness, peace, and life changes. I was also presented with a walking stick made from a eucalyptus tree from Catalina that Dave carved and Doug finished. Couldn’t have asked for a better talisman for this journey I have embarked on. Thank You! 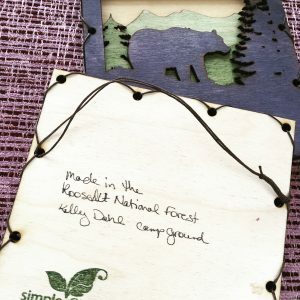 Making art in the woods.